What is a better way to start Valentine's Day than with a run and breakfast (did I mention there will be mimosas??) Our awesome Hoka rep, Sydney, will be here with shoes to test. If you have always wondered what those crazy cushioned shoes feel like-here is your chance. Grab your size, test them out on a 2-4 mile run/walk, and let us know what you think. 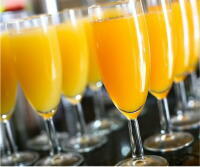 We will welcome you back with coffee, hot chocolate, muffins, and mimosas! Bring your family, bring a date, or just bring yourself.